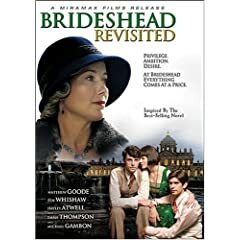 Burbank, Calif., October 17, 2008—A provocative story of love, power, and betrayal featuring a riveting performance by two-time Academy Award® Winner Emma Thompson, Brideshead Revisited arrives on DVD on January 13, 2009 from Miramax Films Home Entertainment. Based on Evelyn Waugh’s much-loved novel of the same name, Brideshead Revisited DVD debut includes deleted scenes and a behind-the-scenes look into the film’s acclaimed recreation of the decadent world of British aristocracy. • The World of Brideshead—Invites viewers to go behind the scenes with the cast and crew of Brideshead Revisited as they reveal the painstaking attention to detail required to capture the lavish world of British aristocracy between the wars. • Audio Commentary—Feature commentary with director Julian Jarrold, producer Kevin Loader and screenwriter Jeremy Brock. • Revealing Deleted Scenes—With optional commentary by director Julian Jarrold, producer Kevin Loader and screenwriter Jeremy Brock. Win a Brideshead Revisited DVD. To enter the contest, simply tell us what you think is the funniest children’s poem you have ever read. Send in your answers using the comment form below. Last date for entries is January 15, 2009.